Arichonan Township. View of interior of barn B2, from West. Arichonan Township. View of upper part of site from South East, showing gable of B2 and two storried house with D2 in foreground. Arichonan Township. View of sheep fank from North North West. View of ventilation hole in winnowing barn. Arichonan Township. View of upper part of site from East. Arichonan Township. View from North. Arichonan Township. Detail of barn B2, showing cruck-slots in North wall and dated lintel. Arichonan Township. View from South West of barn B2. Arichonan Township. View from North East. 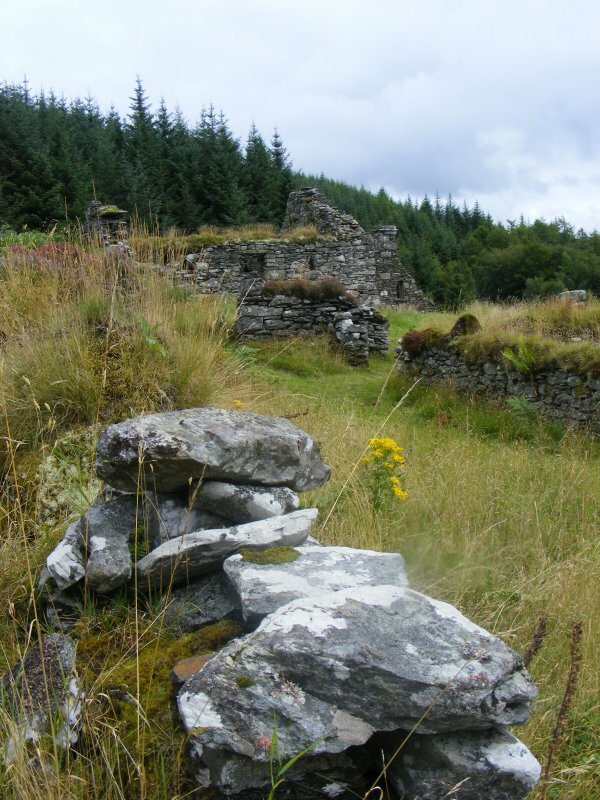 The ruined buildings of this deserted settlement occupy a clearing in a forestry plantation on the NW slope of Gleann a' Ghaolbhan, the valley at the head of Caol Scotnish, some 350m N of the late 19th-century Arichonan farmhouse. It was approached from the valley by tracks from the S and NE, now partially obscured by plantations. The latter track crossed a small stream 120m NE of the township by a slab-lintelled bridge 1m in span and 4.3m in width, and the intervening section is supported on the lower side by a drystone revetment up to 2m in height. A former track running NW from the township can only be traced for a short distance. 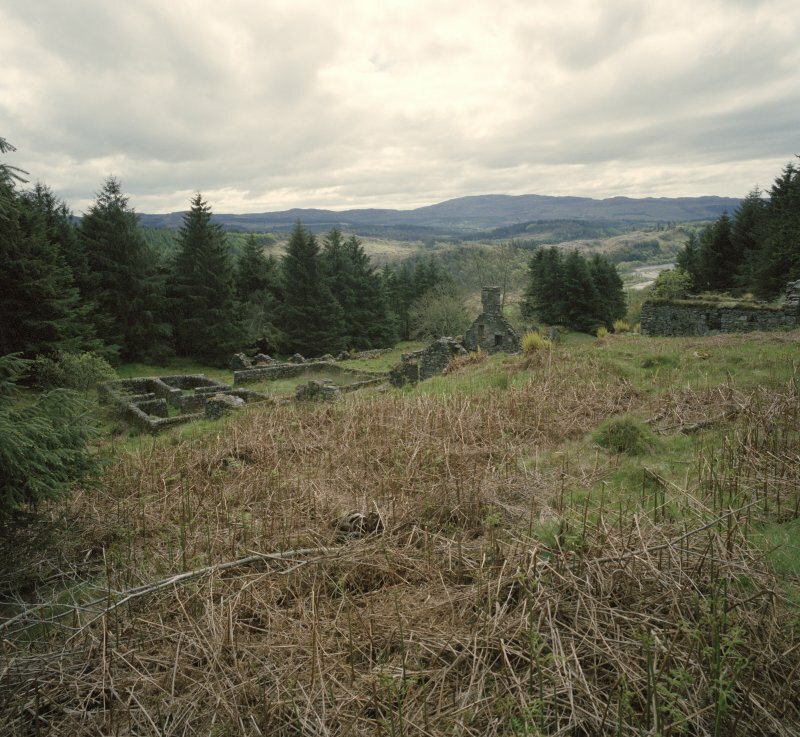 Arichonan was the largest and most important of a group of five townships extending N to Loch Crinan and feued in 1654 by the Campbells of Auchenbreck to Neil MacNeill from Largnahunsion, South Knapdale, whose descendents held the Arichonan estate until the last quarter of the 18th century (1). 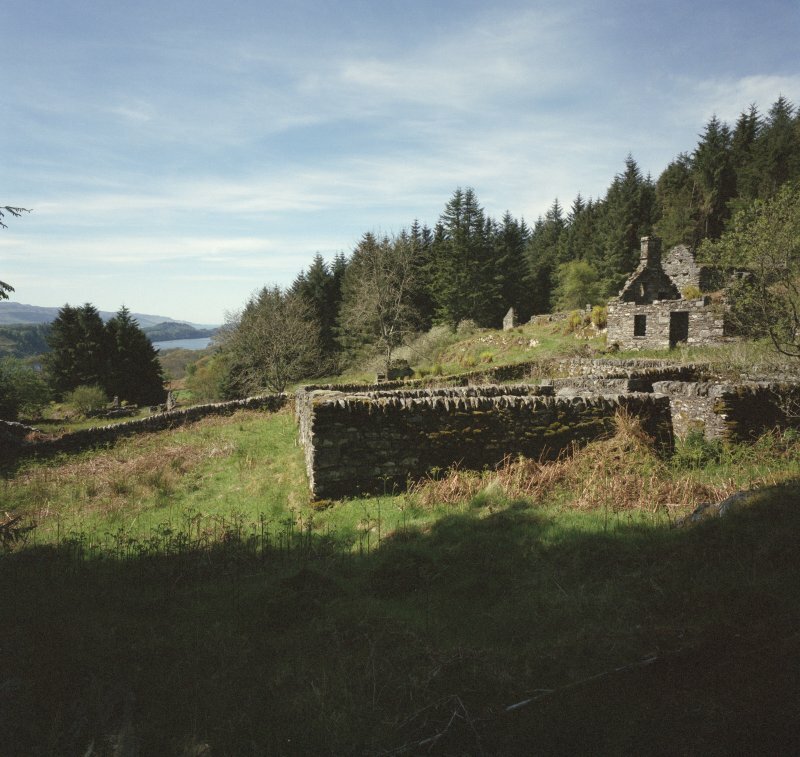 It was purchased in 1800 by Neil Malcolm of Poltalloch, and two years later it was reported that the rent was paid equally by four tenants, each possessing a dwelling of four couples, a barn of two couples and a bothy of one, two or three couples (2). In 1848, when there were three tenants, the township achieved local notoriety through their fierce resistance to attempts by police and estateworkers to enforce an eviction-warrant obtained by the Poltalloch estate. Following an affray which led to requests for military intervention, two of the tenants and the son of a third were sentenced to short terms of imprisonment (3). Thereafter one house was remodelled as a shepherd's cottage, and was still roofed in 1898 (4). The original arrangement of the buildings is somewhat obscured by a late 19th-century sheep-fank and other enclosure-walls, some of them standing on older footings, but other structures which have been removed to provide material for these walls are shown on the first edition (1865) of the OS six-inch map. There appear to have been four groups of buildings, one of which occupies a higher terrace to the NW. In 1802 it was reported that 'the houses in this farm and mostly on this Estate was built by the Tenants themselves and by that way they were not built right at first' (5), and it is probable that most of the existing buildings belong to the first quarter of the 19th century. 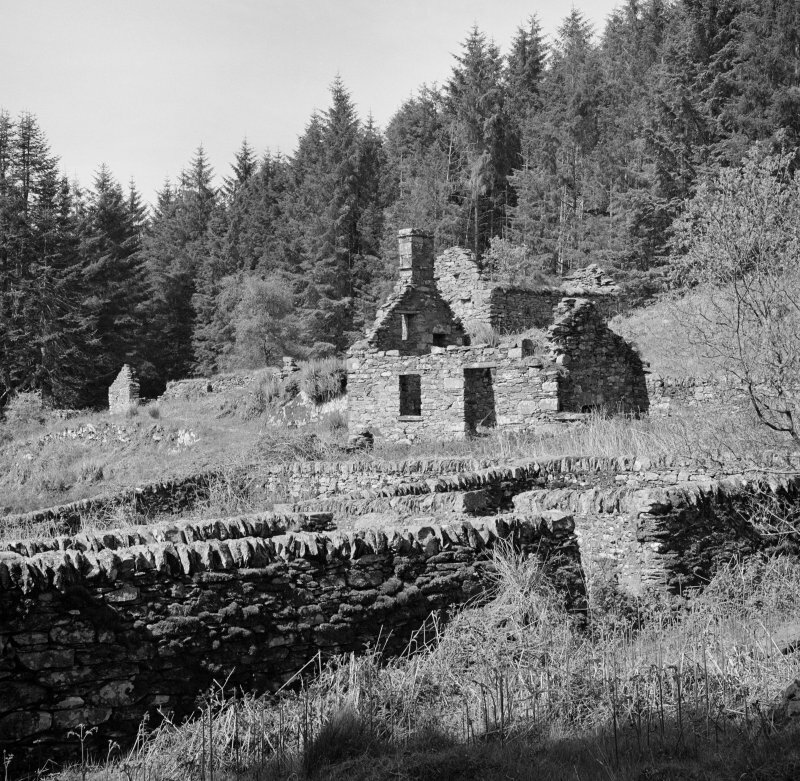 They are constructed of local rubble, either drystone or clay-mortared, and in some cases retain projecting stone pegs for securing thatch-ropes. The least altered of the dwellings (A1), in the S group of buildings, measures 15.2m from NW to SE by 5.8m over clay-mortared walls, and retains slots for five cruck-couples rather than the standard four couples of the 1802 report. This extension probably resulted from the rebuilding of the NW end as a symmetrical three-bayed dwelling with central doorway and gable fireplace, while the lower end was retained as a byre, entered by a doorway in the fourth bay. 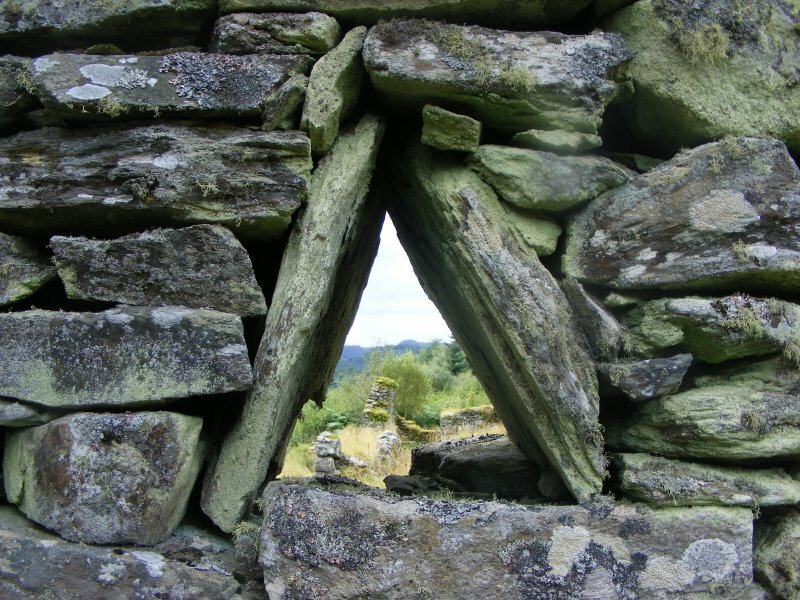 Subsequently a small byre with mural drain, still roofed in 1865, was added to the NW gable of an outbuilding (A2) a short distance S of the dwelling. This building, 9m by 4.5m over all, may be identified from its elevated position as a winnowing barn and the adjacent enclosure to the S was presumably a stack-yard. The footings of another outbuilding of similar scale (A3) lie 6m to the SE. The dwelling in the group on the NW terrace (B1) measures 13.2m from NW to SE by 4.5m over drystone walls 0.6m thick. 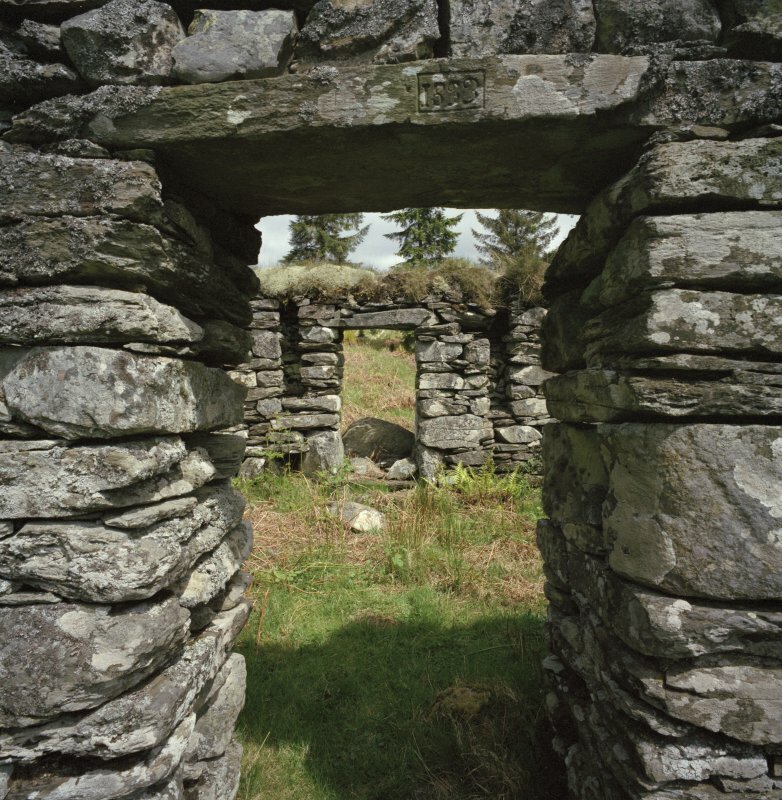 This building was probably of four couples, but its side-walls are much reduced and no cruck-slots can be identified, although two lintelled doorways remain in the NE wall. The gables, however, stand to full height, and one of the E quoins bears the incised name 'Neil McMillan / Arichonan'. A tenant or tenants of this name were recorded in both 1802 and 1848, and since the dwelling of the former was described as 'good' this building may be of earlier date (6). The walls of an enclosure to the S have been partially rebuilt, and a small sheep-fank N of the dwelling possibly obscures a former 'bothy', but further to the N there is a well-preserved winnowing-barn (E2), measuring 9m by 5.8m over clay-mortared walls 0.8m thick. Its SE gable preserves two rows of stone thatch-pegs and the interior was divided by two cruck couples, the side-bays containing opposed triangular ventilation-openings and the centre one opposed doorways; the lintel of the SW doorway bears the date 1833, neatly incised in a rectangular frame. To the N of the barn there is an enclosure within a turf-and-stone dyke, bounded on the NW by a former track. About 20m W of the dwelling B1 there is a stone-lined well draining into a small stream. The two other probable dwellings (C1, D1), now represented mainly by footings although one end of each remained roofed in 1865, appear to have been comparable in scale to E1. Each building has an associated enclosure to the SW. Some 4m N of D1 there is a two-unit clay-mortared building comprising a small ?dwelling with slots for a single cruck-couple, divided by a stone partition from a store or barn having a ground-floor doorway in the SE wall and sockets for a joisted upper floor entered from the adjacent higher ground by an opening in the NE gable-wall. Traces to the E of D1 of an enclosure and a building, already roofless in 1865, have been almost obliterated by fallen trees and the construction of a later wall. Another building between D2 and C1, which was still roofed in 1865 (C2), was probably associated with the latter but has totally disappeared, the sheep-fank. To the NW of the fank, and at the foot of the rocky edge of the NW terrace, there are the remains of the last dwelling on the site, whose core appears to be a clay-mortared building IO.8m long and with gable fireplaces, probably the post-1848 shepherd's cottage. This was subsequently extended to the S, and its front wall rebuilt, with lime-mortared and harled rubble having schist window-dressings and fireplaces; this extension incorporated a loft with a window and fireplace in the S gable, which terminates in a tall chimney. The area of Arichonan was stated about 1800 as 332 acres (134ha), of which 52 acres (21ha) were arable (7); most of this ground is now afforested. 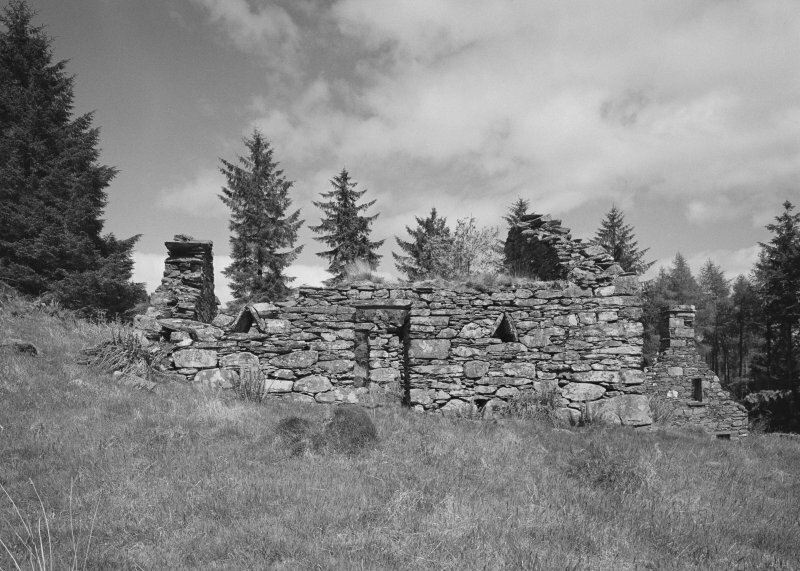 A mill at Arichonan is mentioned in late 18th-century documents, and was identified in 1801 as the 'miln and acre of Glengalvan', while in the following year a dwelling and barn at 'Glengalvin' were included in the survey of Arichonan houses (8). 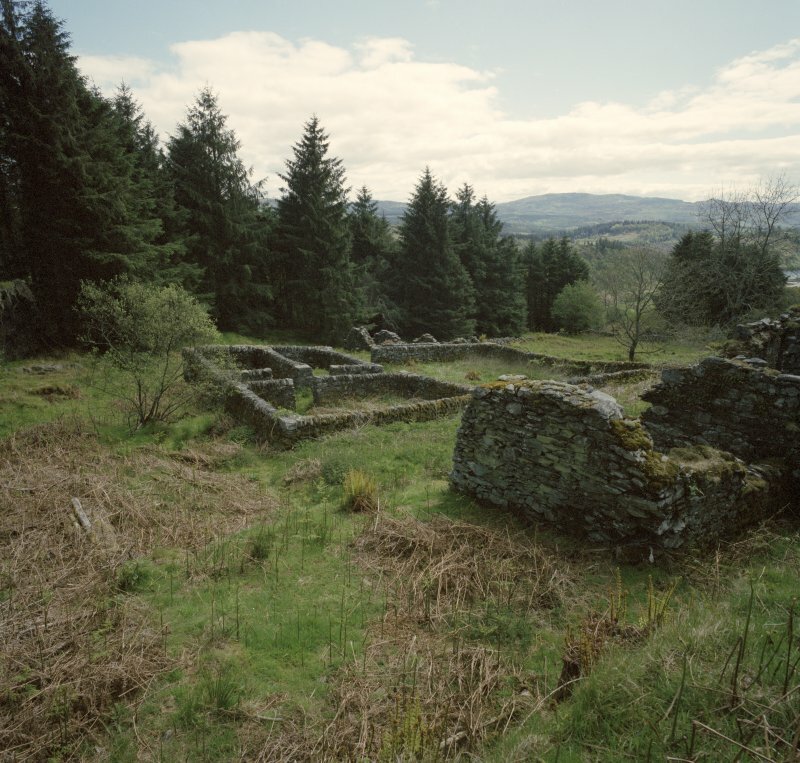 These buildings may be identified with the ruins situated in the valley-bottom at NR 778911, on the E bank of a stream where there are the footings of a possible small mill (9*). 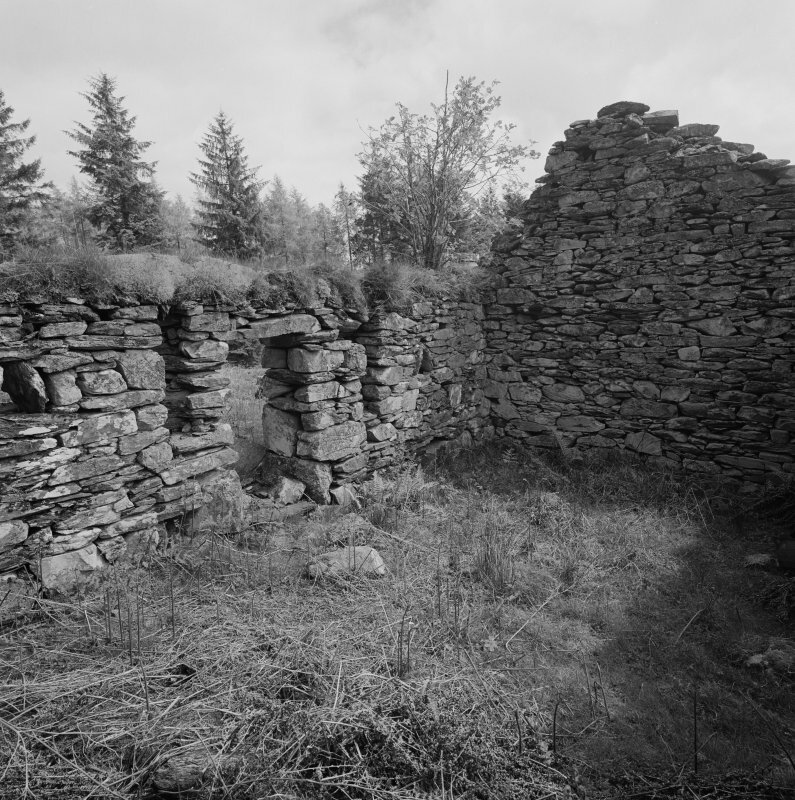 The former change-house and corn-drying kiln situated SE of these buildings, however, belonged to the township of Kilmory Oib (No. 78). The website text produced for Arichonan webpages on the Forest Heritage Scotland website (www.forestheritagescotland.com). 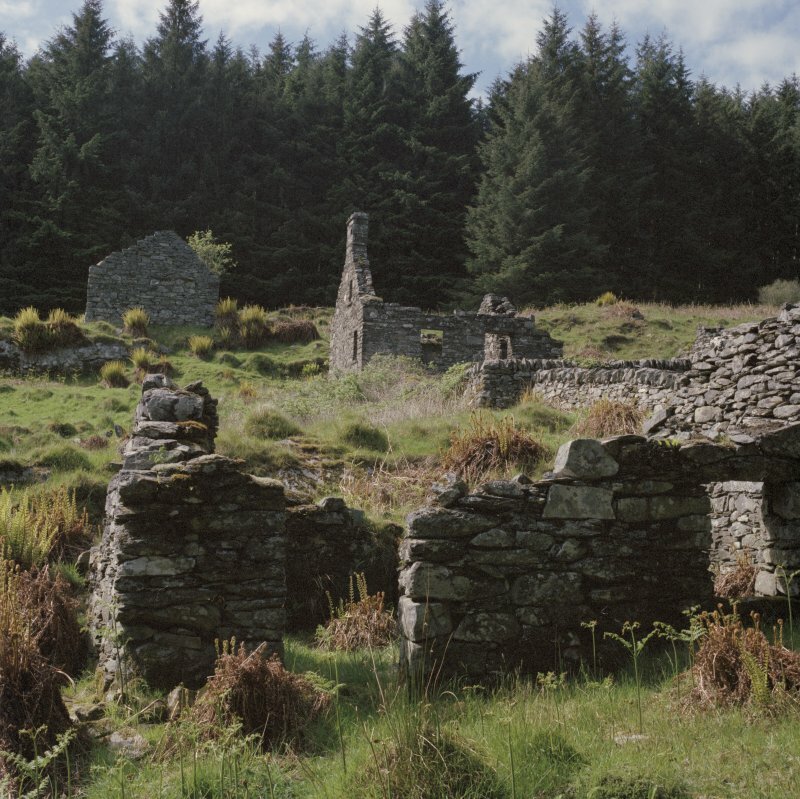 The ruins of Arichonan still stand tall on the slopes of Gleann a Ghaolbhan. Here you can explore inside the homes of people who lived there over one hundred and fifty years ago and more. Evidence within the walls can tell us how these people lived and worked. Why not visit and see what you can discover? In September 1848, Neil Malcolm ordered the eviction of his tenants from Arichonan. The local police arrested four tenants from Arichonan for resisting the eviction. It apparently got so out of hand that there were calls for the military to come to the aid of the police. A court found Catherine Campbell, Mary Adams, Neil McMillan and Duncan McLean guilty and imprisoned them at Inverary jail. The jail still holds the records of their imprisonment. Neil Malcolm bought land in Australia in the hope of moving his unwanted tenants there but they refused to go. Considering their history, this seems unsurprising! A township, comprising seven roofed, three partially roofed, three unroofed buildings and seven enclosures is depicted on the 1st edition of the OS 6-inch map (Argyllshire 1873, sheet clx). Four unroofed buildings and seven enclosures are shown on the current edition of the OS 1:10000 map (1979). Information from RCAHMS (AKK) 18 May 1999.